A friend organised a trip to Tate Modern to see the new Damien Hirst exhibition. To be honest, I’m not really a fan of his. Partly it’s the distaste I have for the overtly commercial imperatives placed on his work, either by him or others, and partly it’s the nature of it. You hear stories about his team doing much of the work, and the factory like nature of it. To be honest, I’m not in any way dissuaded from this view having visited the exhibition. In fact, I’m not at all sure that it does him any favours. We see repeated instances of the same things over and over. His earliest work is perhaps newest to me. A ping pong ball suspended in mid-air over a hair dryer – something that my physics teacher did to demonstrate the Bernoulli Effect when I was at school. This is later repeated in a large version utilising a bigger fan and a beach-ball. Hirst’s “logo” is a take on pharmaceutical company Bayer’s logo, and one wonders whether he got a bulk discount from them for the vast number of packets of medicine in the various pharmacy cabinets on display. The same thing over and over. A friend told me it was like his parents place of work – they were pharmacists. Then there are shelves of medical tools and teaching models. It’s like someone came back late one night a little drunk, and went mad with a credit card on eBay. Of course we get the famous dissected animals, as well as a couple of sharks. These are skillfully done, but I’m left wanting. I did like the swirly paintings, and the dots, although repetitive are interesting (You’re much better off visiting Yayoi Kusama who’s still on there. I found her take on such things more interesting). As much as anything, it’s the work that’s gone into some of the exhibits that overwhelms you – carefully laying out all those tablets, or building those stained glass windows from butterfly wings. I’m much less certain about rotting carcasses with maggots and flies, and certainly the butterflies feel slightly disturbing, as you watch Tate employees pick up ones that are dying. Actually, the thing that makes me confirm my views on Hirst is the shop. There, you can buy a print of a photo of an exhibit for over £30,000 and it doesn’t come framed. There is a wall of such prints (not all so expensive) in the shop, and it leads me to wonder whether I wasn’t at a more traditional gallery, and whether the prints shouldn’t have been out on the walls with little red stickers underneath them. 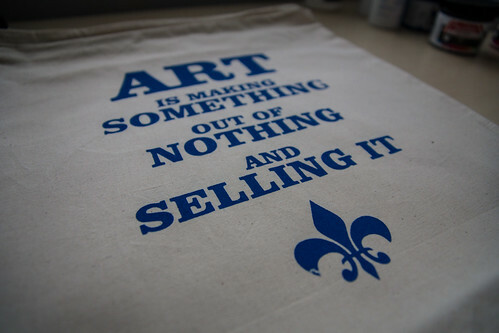 So maybe Frank Zappa’s quote on these bags is even more appropriate than I thought it’d be when I produced them. A slight aside now. 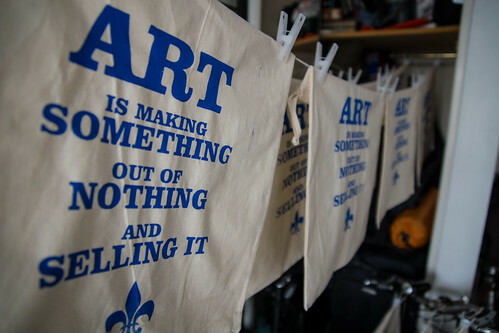 I made these with a Speedball screen printing kit. It took me a couple of attempts to get the photo emulsion right, but now I have a photoflood light bulk (do they even make such things any more?) complete with foil pan tray to “expose” my pictures. I also have a couple of screens. Not every bag was perfect as you can see from the pictures, but I’m getting to grips with things now. A course might be in order. I went to the Damien Hurst exhibition today, and have to say I enjoyed it. Found the rest of the Tate a bit boring at the moment though… are they holding back for the time being to focus all of the attention on the Hurst exhibition. The other interesting thing is that For The Love Of God was not part of the main (ticketed) exhibition, but is available for free on the lower concourse, although only for a short while. Apparently, the cow was actually number three, as he couldn’t get the first two quite perfectly in half.